How many times have you set your cruising gennaker or spinnaker in light conditions and then seen the wind steadily increase to 15 knots or more? Sailing with a spinnaker in that strength of wind is not the problem; it's getting it down safely and in one piece that's the issue, especially if you are shorthanded. The Hyde snuffer removes the worry and enables you to set and handle your cruising gennaker or spinnaker whatever the conditions. The Hyde snuffer has a moulded plastic bell mouth which is attached to a light weight sock made from nylon mesh which is sewn a separate pocket which houses the control lines. The separation of these lines from the sock ensures that they cannot twist around the sail; it also eliminates friction and chafe when hoisting or lowering. At the top of the snuffer is a short stainless wire strop, one end of which is attached to the halyard and the other via a swivel to the head of the sail. Once the sail has been hoisted safely in the sock setting it is simple, just hoist the bell mouth to the head of the sail and trim the sheets. To douse the spinnaker, ease the sheet and pull the bell mouth down the sail with the control line. Lower the halliard and the job's done. 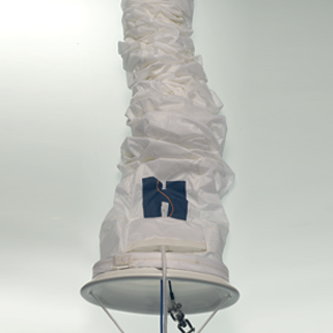 Each snuffer comes with clear instructions on loading, setting and lowering the spinnaker. Our snuffers are supplied in meter lengths, thus a size 11 equates to an eleven meter sock length. We recommend using a sock size to the nearest meter shorter than the sails luff length.